Scottsdale-based ATOM is trying to bring hotels into the 21st century using a new device called Cirq+. The hub has the potential to replace outdated phone charger/radio combos, thermostats and other legacy systems in one small package and turn existing hotel rooms into energy-efficient, internet-connected smart rooms. The product is one of the latest items developed by ATOM, which is located at ASU’s SkySong Center in southern Scottsdale and led by husband and wife co-founders Yani and Jodi Deros. Though the Deros live in Ahwatukee, Yani said sometimes he feels more like a Scottsdale resident because they spend so much time at the office and have even participated in local groups and initiatives aimed at revitalizing southern Scottsdale. Over 15 years, ATOM has conceptualized, tested and developed over 300 products for a range of national and global brands, from Honeywell, KitchenAid and UBS to Axon, formerly Taser International. The research and development company typically develops solutions in response to problems brought to it by companies. This time around, ATOM is responding to a problem facing the entire hotel industry, in which property owners are typically slow to adopt new technologies because of the cost and labor associated with the endeavor and problems integrating new tech with legacy systems. The modular device, which looks a lot like a sleek cylinder that sits on the bedside table, features interchangeable parts that can be pulled out and upgraded as technology changes. For instance, the device would not be rendered entirely obsolete if a company adopts a new technology in its devices, such as when Apple adopted Qi charging wireless charging standard with the iPhone 8. When new tech comes along, hotel owners can simply switch out the affected module, leaving the rest of the Cirq+ intact. That is one thing that sets it apart from those old phone charger/radio combos that are common in many hotel rooms. Many of those still feature the old 30-pin chargers for iPhones that were largely rendered obsolete when Apple changed to the small lightning charger. And it does a lot more than just charge phones. Depending on the model, it allows guests to control thermostats, lights and interface with the front desk and room service. One benefit of the app, Yani Deros said, is a user’s preferences, such as room temperature, will travel with them between Cirq-equipped hotels to create a more personal experience. The technology has benefits for hotel operators, too. The devices allow hotel operators to control energy costs and include thermal occupancy sensors to allow hotels to reduce guest energy consumption when rooms are not occupied. “With the (Cirq+), we can actually control plugs, lights and, in the future, water,” Yani Deros said. He said that controlling water will be a big saver in the end for hotels, because currently guests use as much of the finite resource as they want. That benefit comes at a cost, though ATOM did not divulge the up front costs of its different Cirq models or any associated subscription rates. Still, Yani Deros said operators will see a return on their investment based on an analysis the company did of hotel properties’ energy costs. “So what we’ve seen is that on a budget hotel it’s about $2,400 per room per year, and that’s just for energy, and with the cost of our system, we will deliver a (return on investment) in two years or less,” he said. He said owners in high-energy cost locales like Hawaii and Puerto Rico could see a return on investment in less than a year. So far, the response from the hotel industry has been positive. Cirq is already equipped at The Clarendon Hotel in Phoenix and is also going in at the Scottsdale Plaza Resort. Yani Deros said the devices will help control costs associated with the aging HVAC system at the 27-building resort. The under-construction Element Hotel at SkySong is also interested in using the technology, Deros said. Every year, The Lodging Conference brings together property owners, vendors and other hotel professionals from around the world to talk development, finance and the state of the industry. 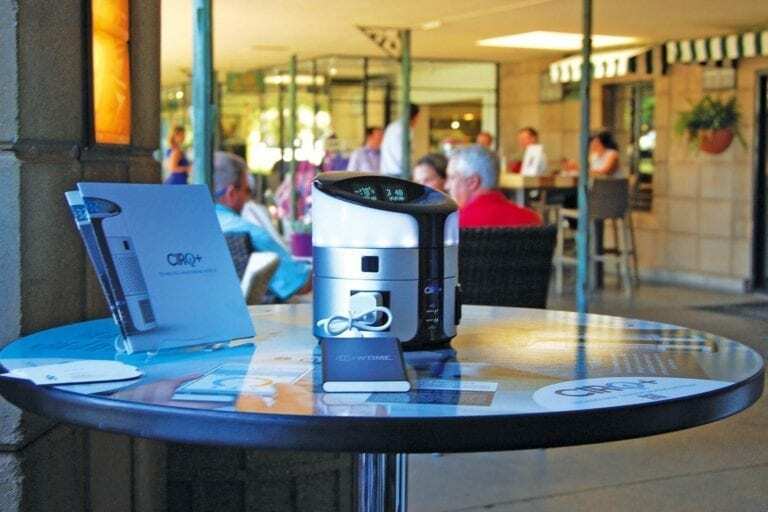 The conference, which always takes place in the Valley, was at the Biltmore Hotel in Phoenix this year and featured sample Cirq+ devices on tables throughout the conference.